Adds a column to the Edit Pages Dashboard screen displaying the Page Template assigned to each Page. Compatible with WordPress Multisite. Requires WordPress version 3.1 or greater. Download the current version of Reveal Page Templates (v1.3.1). Downloaded 5,613 times. This plugin adds a column to the Edit Pages screen in the Dashboard which displays the Page Template filename assigned to each Page. This gives you an at-a-glance overview of the Page Templates assigned to Pages, without having to open each Page to find out. The new column is sortable too! This is a very simple plugin. Just install, activate and forget about it. Download the latest version of the plugin to your computer. Extract and upload the folder reveal-page-templates to your /wp-content/plugins/ directory. Please ensure that you do not rename any folder or filenames in the process. Activate the plugin in your Dashboard via the "Plugins" menu. Install the plugin in your /plugins/ directory (do not install in the /mu-plugins/ directory). 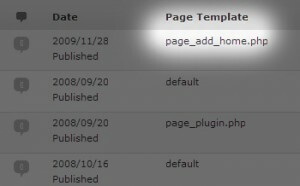 In order for this plugin to be visible to blog owners, the plugin has to be activated for each blog by the Site Administrator. You can use the Wordpress Automatic Plugin upgrade link in the Dashboard Plugins menu to automatically upgrade the plugin. Studiograsshopper is currently being overhauled, tweaked, polished and honed, thanks to a wonderful new child theme for the Genesis Framework courtesy of AppFinite. Unfortunately, this means that in the very short term, as I move and reconfigure content, certain things may look a bit weird or crocked in some way. Panic ye not! I'm fixing stuff as quickly as possible.